A few days ago I shared last year’s healthy Halloween treat (jack o lantern oranges) on Facebook making the comment we should save the sugar for the Christmas cookies. 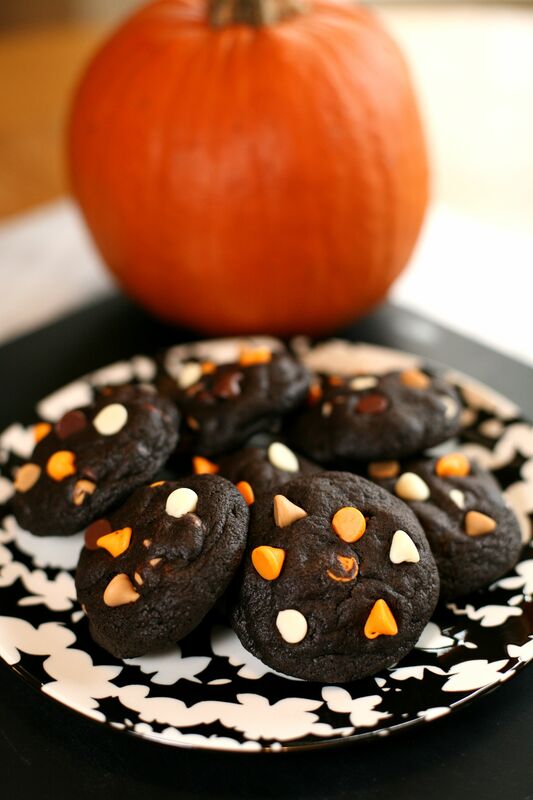 I’ll have to request you look past that comment as I now write about the Halloween cookies we made yesterday that are clearly filled with that exact ingredient. In my defense, my thirteen year old stepdaughter wanted to bake with me so all rules were immediately tossed aside to take advantage of an occurrence that’s less frequent these days. No one warns you how quickly your kids will turn into teenagers. Maybe they do actually, at every holiday and family reunion, but for some reason you just don’t believe them. Saying it happens in the blink of an eye is no exaggeration. So before we blink again and she’s away at college I’m ecstatic to add another memory in the kitchen together. Just before we were about to roll the dough into balls and start the actual baking and cleanup process, friends came over and my helper was off to play! I couldn’t say no, because as much as I love to do things with her I also love the picture of her running in and out of the house laughing with friends and making those special childhood memories. And you know Hailey was promptly back for taste testing, which some may argue as the most important part of the process 🙂 I was thankful for her group of friends tagging along, because I had to hand out some of these cookies that are testing my self discipline by the hour. 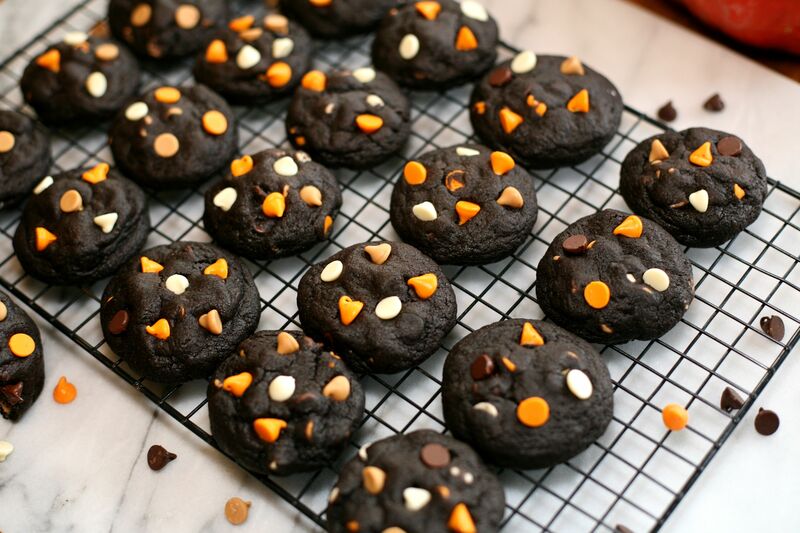 These Halloween themed cookies are incredibly simple to make and deliciously rich. They also taught me Nestle makes Halloween themed chocolate chips; I don’t recall seeing these in the past, but love the orange chips and the festive feel they give the cookies! The brown (peanut butter) and white (chocolate) chips are a perfect addition to complete the holiday color scheme. 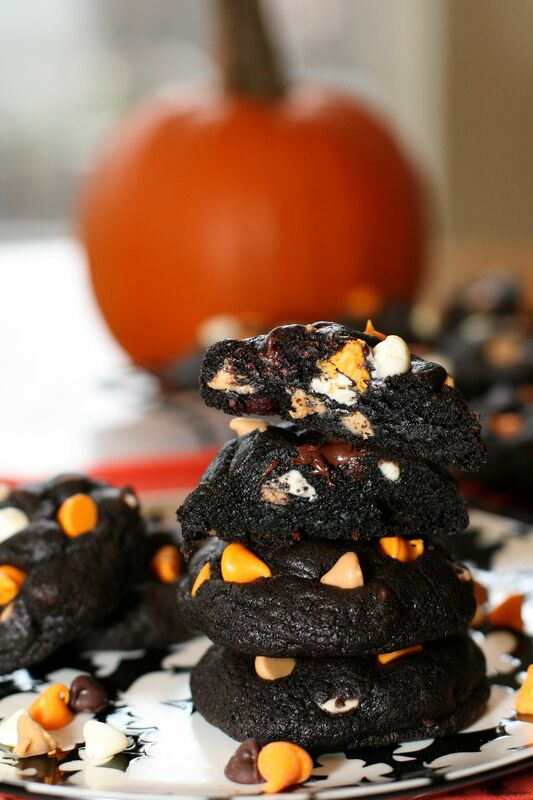 Perhaps I should go whip up a healthy treat now to compensate for the unplanned sugar and to offset the candy overload that will come from trick or treat tonight! It’s either that or we begin the use of ‘Tis the season’, right? 🙂 On that note, check out the recipe below and have fun baking! In a large bowl of a stand mixer, combine the butter and sugars and beat for 3-4 minutes. Add eggs and vanilla and mix well. Add the flour, cocoa powder, baking soda and salt and mix on low speed, just until combined. In a separate bowl, combine the Halloween chips, white chocolate chips and peanut butter chips and stir gently to evenly distribute. Fold in 1 3/4 cups of the chips into the cookie batter and set the remaining chips aside. Scoop 1- 2 tablespoons of cookie dough for each cookie and roll between the palms of your hands to shape into balls. Once the dough is shaped, place the balls on the prepared baking sheet 2 inches apart and bake for 8-10 minutes, just until set. Remove the cookies from the oven and immediately press a few of the reserved chips into the top of each cookie to complete the festive look. Transfer to a wire rack to cool completely and store in an air-tight container.